Come join us for our 4th Annual Turkey Trot. We have added the Wild Gobbler to this years event, and expect this to be our best Turkey Trot event ever! Great door prizes, including a 43” TV, all participants are eligible. See provided information below. Please let us know if you have questions or concerns. See you on race day! Benefiting – Sheep Dog Impact Assistance and their Holiday Outreach program. Event: 2012 Turkey Trot/5K Charity Run, 1-Mile Fun Walk, and the 5K Wild Gobbler (CrossFit run and workout – see WOD info below) at the Center for Nonprofits @ St Mary’s in the heart of Rogers, AR. Date & Time: Thursday, November 22nd, 2012, Race Start Time is 9:00 AM. Location: Center for Non-Profits at the former St. Mary’s Hospital in Rogers, AR. Organizers: The 2012 Turkey Trot Committee, comprised of Northwest Arkansas community volunteers and philanthropists, seek to provide a fun family event, benefiting our military, law enforcement, fire & rescue, and EMS personnel in need. Participants: This race is open to the general public, any and all race/fun walk enthusiasts are encouraged to attend. Supporters and sponsors of the 2012 4th Annual Turkey Trot. *Amenities: * We will have a 5K/3-Mile Run, 1-Mile Fun Walk, and Wild Gobbler route; concessions; face painting; sponsor giveaways, and much more. Fun for the entire family! 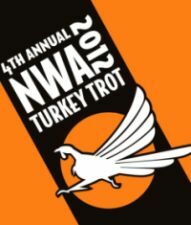 The first 200 runners & Wild Gobblers signed up will receive a 2012 NWA Turkey Trot t-shirt, and a gift bag filled with great items from our sponsors. Beneficiaries: Sheep Dog Impact Assistance, headquartered in Rogers AR, focuses on supporting the unique needs of our veteran “Sheep Dogs”; society’s protectors, the men and women that form the ranks of America’s military, law enforcement, fire & rescue, and EMS. Disaster relief missions, and disaster preparedness education classes for communities in need, are an additional part of their mission. Sheep Dog IA is a nonprofit, nonpartisan organization. *First station WOD: will start at CFN – hand release push ups – In memory of Tyrone Woods, former US Navy SEAL, killed on Sept 11th, 2012 while defending the U.S. Consulate in Benghazi, Libya. Tyrone was working at a CIA annex close to the Consulate when it came under attack. He was one of only a few responders able to make it to the U.S. Consulate in an attempt to rescue the U.S. Ambassador. Our workout reps in honor of Tyrone are based on the date he was killed, 9/11/12, for a rep count of 32…you will do 32 hand-release-push-ups. – Run to First Christian Church. *Second station WOD: First Christian church on Oak and 13th St. – lunges – In honor of Cyle Harris, a former Firefighter and U.S. Army Soldier, currently fighting ALS. Cyle served 4 years in the US Army, and spent 10 years as a Sherwood, AR firefighter before being diagnosed in 2009 with ALS. Our workout reps in honor of Cyle are based on his rugby number, #12, multiplied by the number of years he has been fighting ALS, 3, for a grand total of 36…you will do 36 lunges. – Run to Elmwood middle School. *Third station WOD: Elmwood middle school – burpees – In honor of Lt. Brian Murphy, a 21-year veteran of the Oak Creek, Wisc., police department. The heroic Police Officer was shot nine times while trying to stop a Wisconsin Sikh temple massacre on Aug. 5, 2012, a tragedy that saw six worshipers killed. Our workout reps in honor of Lt Murphy are based on the date and number of times he was shot…8/5 & 9 (times shot), for a total of 22…you will do 22 burpees. – Run back to First Christian Church. *Fourth Station WOD: First Christian church on Oak and 13th St. – 30 yard hand stand walk air bear crawls – In honor of SSgt Chris Bannister, a U.S. Marine recently injured in Afghanistan. Chris was on patrol Oct 19th when he was hit by an Improvised Explosive Devise (IED) and is currently recovering at Fort Sam Houston, San Antonio, TX. Our workout reps in honor of SSgt Chris Bannister are based on his rank, SSgt/E-6…you will do the 30 yard bear crawl 6 times. – Run back to CFN. 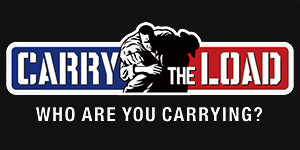 *Fifth station WOD: will finish at CFN – air squats – In memory of Capt. Donald Jones, a Jacksonville, AR firefighter who was killed March 19th, 2012 while working the scene of an accident. A fellow fireman and police officer were also injured during the incident. Capt Jones was a 31 year veteran firefighter. Our workout reps in honor of Capt Jones are based on the date he was killed…3/19/12, for a total of 34…you will do 34 air squats. Let us know if you have questions or concerns. Let’s have fun! Sheep Dog Impact Assistance is a registered 501(c)3 non-profit organization.